The What:Bose Professional is now shipping its F1 Model 812 Passive Flexible Array loudspeaker. 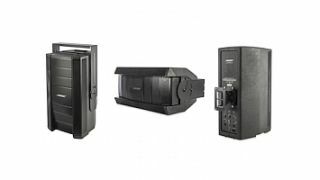 This passive loudspeaker offers “FLEX array technology.” The ability to configure the array into four unique shapes allows installers to focus sound to target listening areas, offering power and clarity for a wide range of applications and venues. The What Else: The passive F1 loudspeaker is designed for permanent installations in sports bars, live music venues, clubs, schools, houses of worship, and any small to medium size venue requiring a high performance loudspeaker solution. Engineered with an array of eight Bose proprietary 2.25-inch drivers, 100-degree horizontal waveguides, a 12-inch woofer, and a lower crossover point, F1 Model 812 passive loudspeakers deliver SPL performance while maintaining vocal and midrange clarity. The F1 Passive loudspeaker has a rugged enclosure with six M8 threaded insert points that can be combined with a full suite of optional mounting accessories including pan and tilt, yoke and U bracket options. The Bottom Line: Both the portable and installed F1 systems offer easy setup, aesthetically pleasing design, and rugged durability.